Mr. George R. Sims has established) a record. 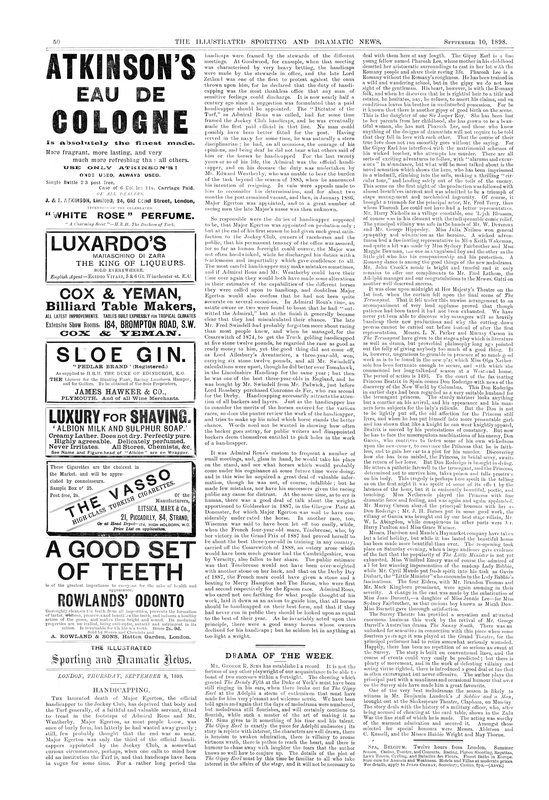 It is not the fortune of any other playwright of our acquaintance to be able to boast of two successes within a fortnight. The cheering which greeted The Dandy Fifth at the Duke of York’s must have been still ringing in In his ears, when there broke out for The Gipsy Earl at the Adelphi a storm of enthusiasm that must have made for him very pleasant and welcome music. We have been told again and again that the days of melodrama were numbered, but melodrama still flourishes, and will certainly continue to flourish, while such a master of the art of making it as Mr. Sims gives to it something of his time and his talent. The Gipsy Earl is exactly the piece for Adelphi audiences; its story is replete with interest, the characters are well drawn, there is heroism to awaken admiration, there is villainy to arouse virtuous wrath, there is pathos to reach the heart, and there is humour to chase away with laughter the tears that the author knows so well how to conjure up. The details of the plot of The Gipsy Earl must by this time be familiar to all who take interest in the affairs of the stage, and it will not be necessary to deal with them here at any length. The Gipsy Earl is a fine young fellow named Pharoah Lee, whose mother in his childhood deserted her aristocratic surroundings to cast in her lot with the Romany people and share their roving life. Pharoah Lee is a Romany without the Romany’s roughness. He has been trained in a wild and wandering school, but in the gipsy we do not lose sight of the gentleman. His heart, however, is with the Romany folk, and when he discovers that he is rightful heir to a title and estates, he hesitates, nay , he refuses, to assert his claims, and on conditions leaves his brother in undisturbed possession. For be it known that there is another gipsy of good birth on the scene. This is the daughter of one Sir Jasper Roy. She has been lost to her parents from her childhood, she has grown to be a beautiful woman, she has met Pharoah Lee, and those who know anything of the designs of dramatists will not require to be told that they will fall in love with each other. That the course of their true love does not run smoothly goes wit hout the saying. 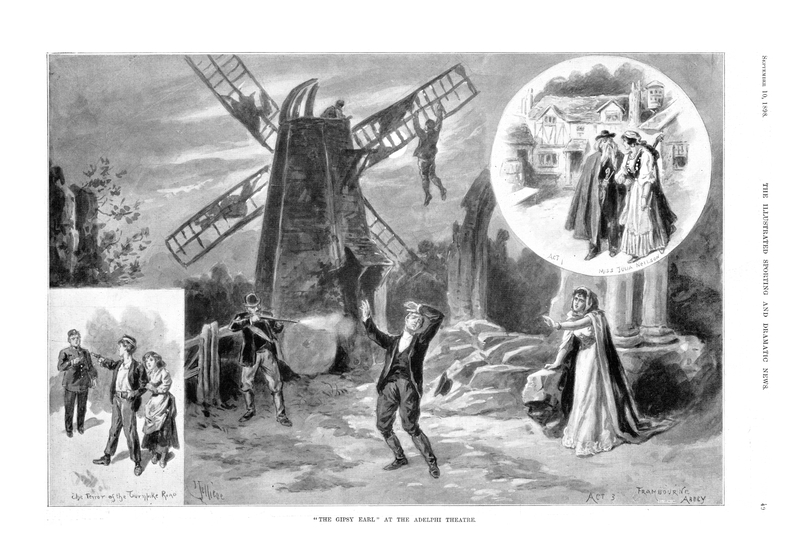 For the Gipsy Earl has interfered with the matrimonial schemes of his wicked brother, who attempts his murder. 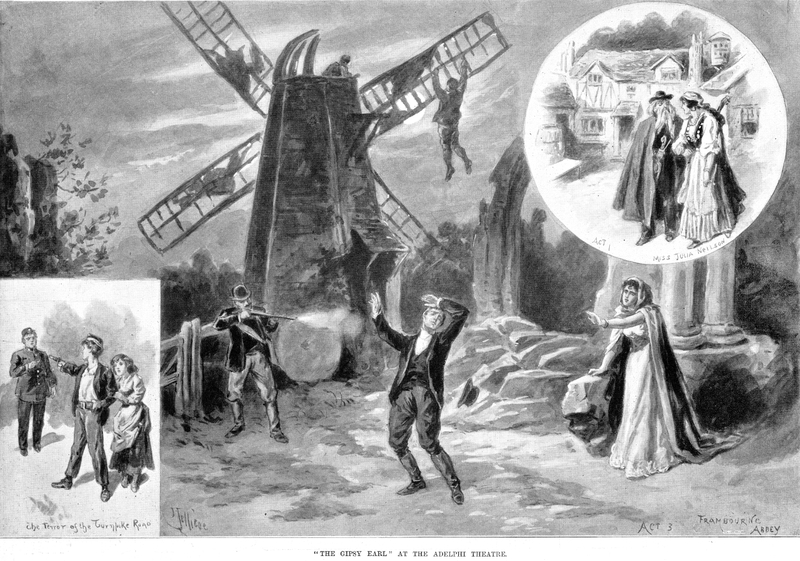 There are all sorts of exciting adventures to follow, with "alarums and excursions" in abundance, but what will be most talked about is the novel sensation which shows the hero, who has been imprisoned in a windmill, climbing into the sails, making a thrilling "circular tour," and landing safely out of the toils of this enemy. This scene on the first night of the production was followed with almost breathless interest and was admitted to be a triumph of stage management and mechanical ingenuity. Of course, it brought a triumph for the principal actor, Mr. Fred Terry, than, whom Pharoah Lee could not have had a better representative. Mr. Harry Nicholls as a village constable, one ‘Lijah Blossom, of course was in his element with the indispensable comic relief. The principal villainy was safe in the hands of Mr. W. Devereux and Mr. George Hippesley. Miss Julia Neilson won general sympathy and admira tion as the heroine. A wicked adventuress had a fascinating representative in Miss Keith Wakeman, and quite a hit was made by Miss Sydney Fairbrother and Miss Maggie Bowman, The one as a vagabond boy and the other as this little girl who has his companionship and his protection. A Romany dance is among the good things of the new melodrama. Mr. John Crook’s music is bright and tuneful and it only remains to offer out compliments to Mr. Fred Lathom, this Adelphi manager and our congratulations to the Messrs. Gatti on another well-deserved success.